Last week, I took the boys to visit a very good friend of ours in Dundee for two nights. The weather was gorgeous when we arrived, and we hit the beach straight away, but the next day it was chucking it down with rain. 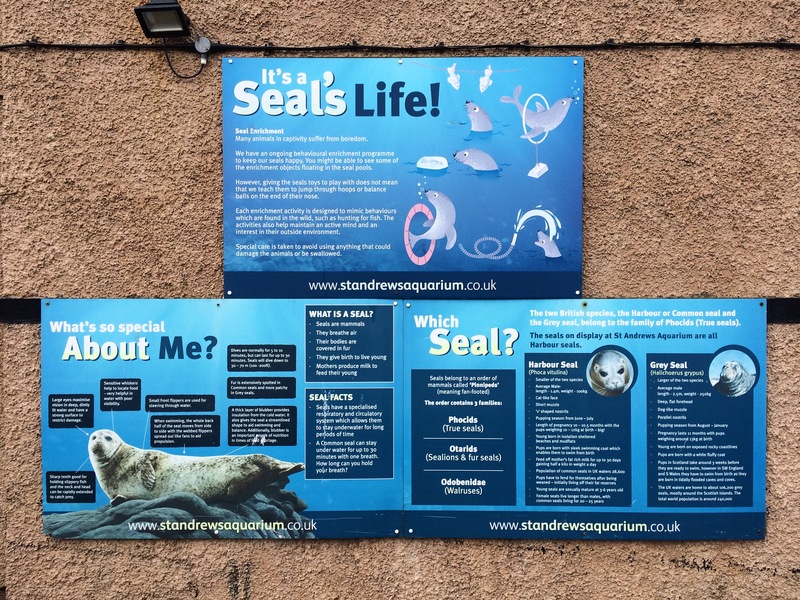 As we’ve visited Dundee several times before and wanted to do something new with the kids, we decided to drive along the road to St Andrews to check out the Aquarium there. 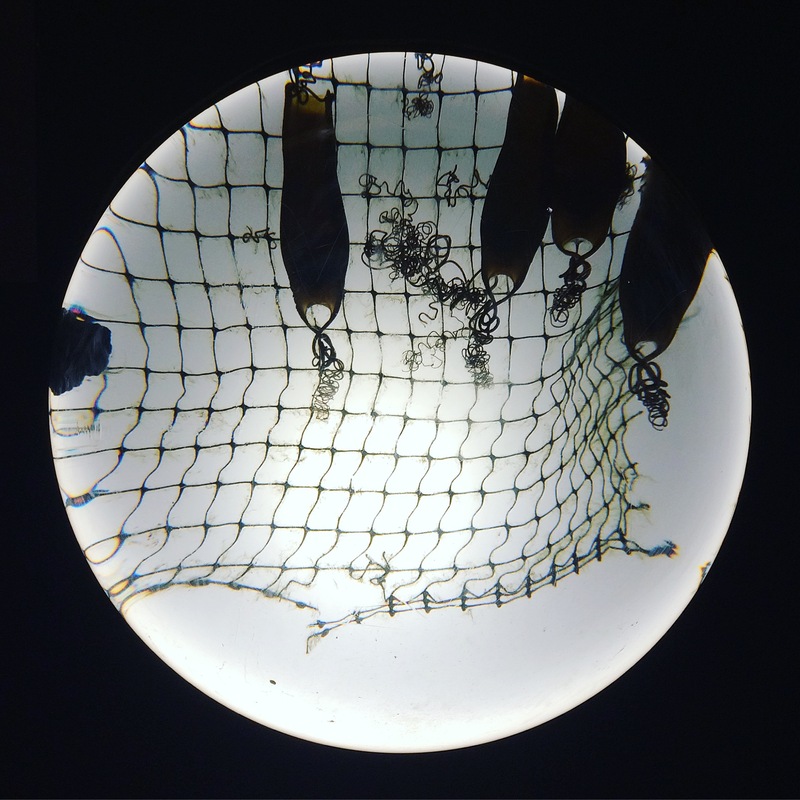 I never even knew St Andrews had an Aquarium, until my friend suggested it. 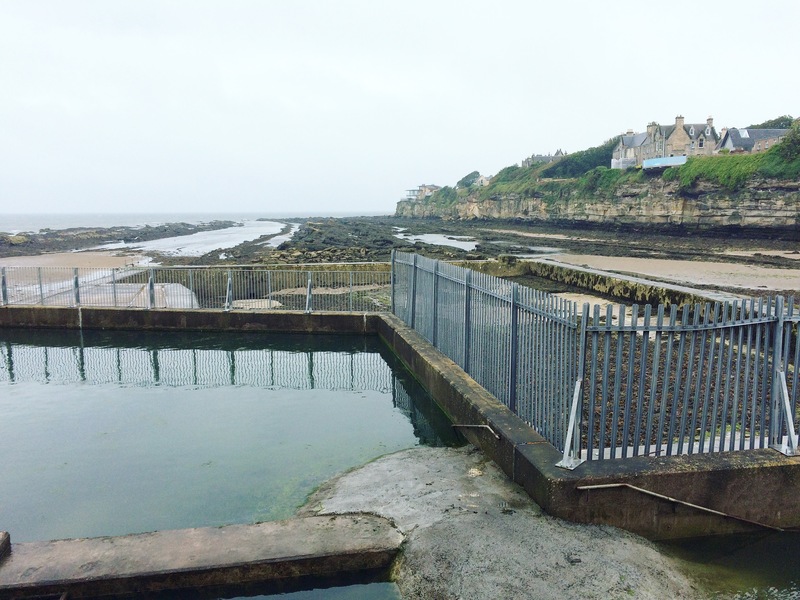 It’s situated right on the coast, on the north facing cliffs, with views of St Andrews Bay. And, judging by the queue at the ticket desk, it’s obviously a popular wet weather destination. But we didn’t have to wait long to get in. 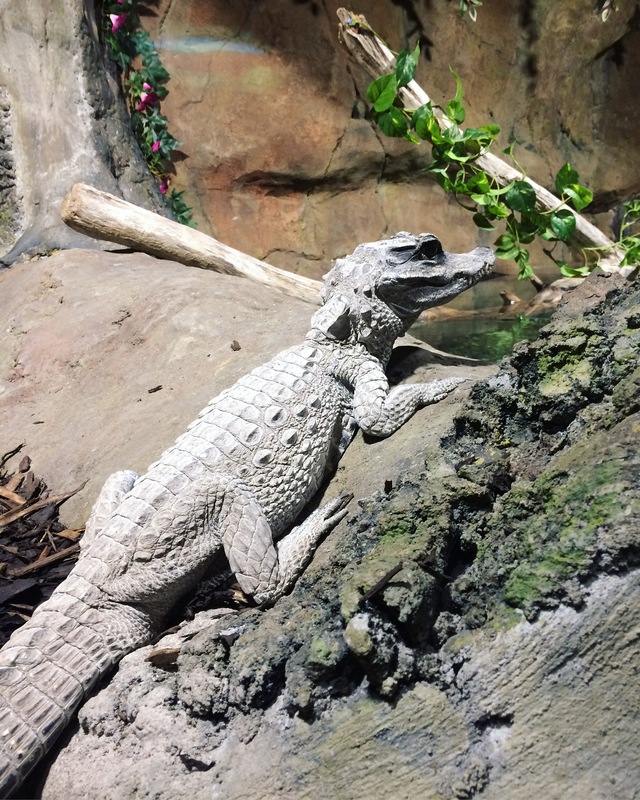 As you would expect from an Aquarium, there were plenty of fish – including rays, piranhas, and sharks, to name just a few of the boys’ favourites – but also other water dwellers such as aquatic reptiles, amphibians and crustaceans. 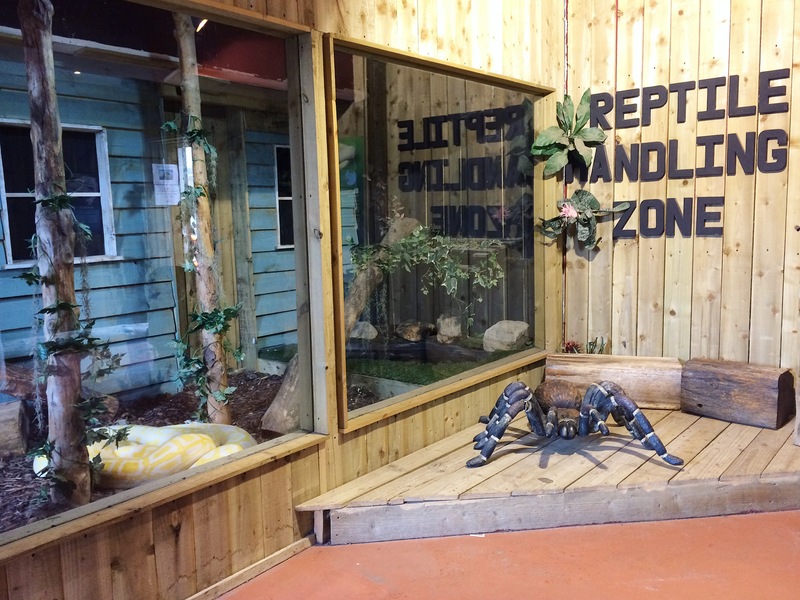 In the Amazon Room, you can also encounter an army of leaf cutter ants. 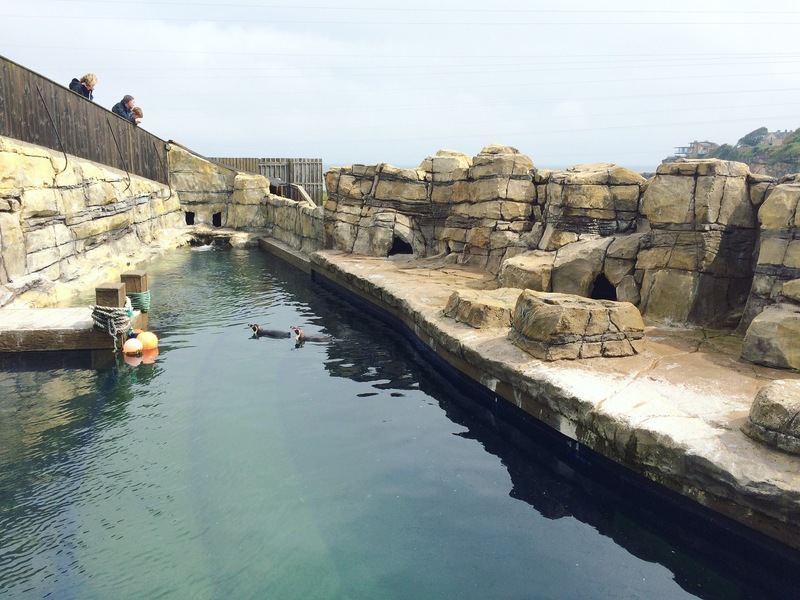 One of the outdoor enclosures houses a small group of harbour seals. We had just missed the feeding time, but a couple of seals came out for another nosey once the rain had stopped. 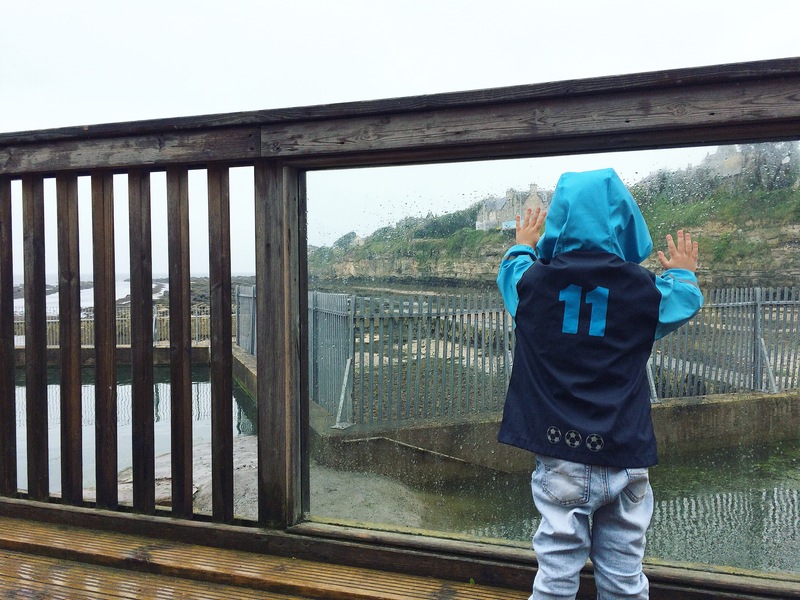 And from you the viewing area you have stunning views of St Andrews’ coast line. 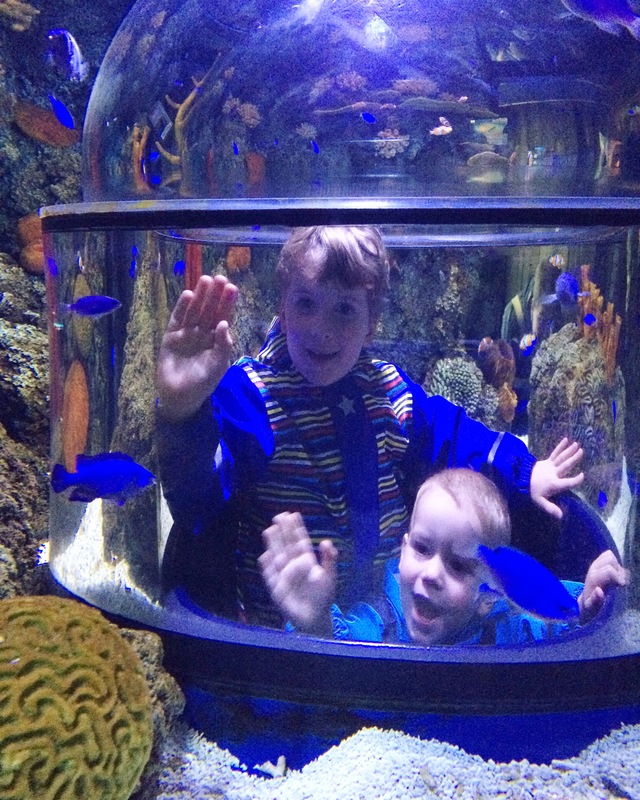 Back indoors, we were ready for some more fish – the boys particularly enjoyed the fish tank you could stand inside! 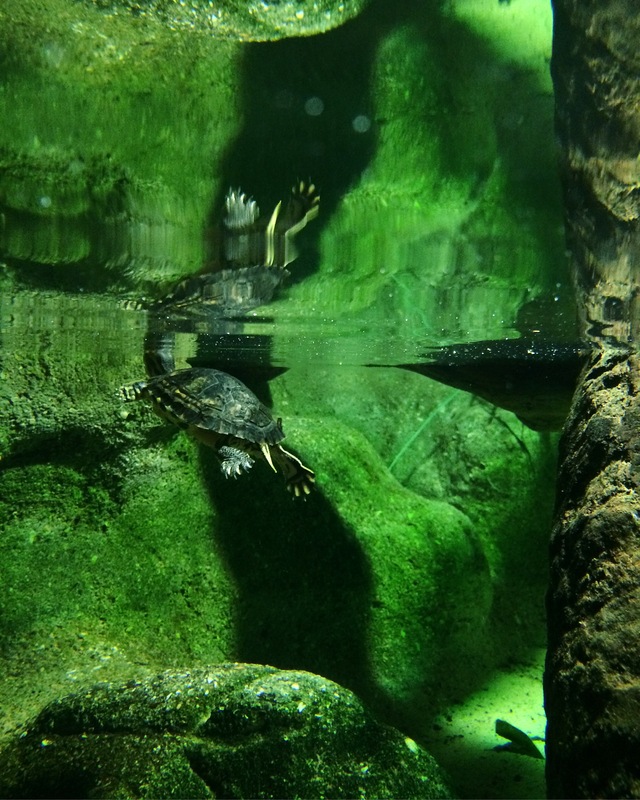 We couldn’t quite figure out the aquatic connection of the Meerkats, and the Aquarium’s website doesn’t give an explanation either. 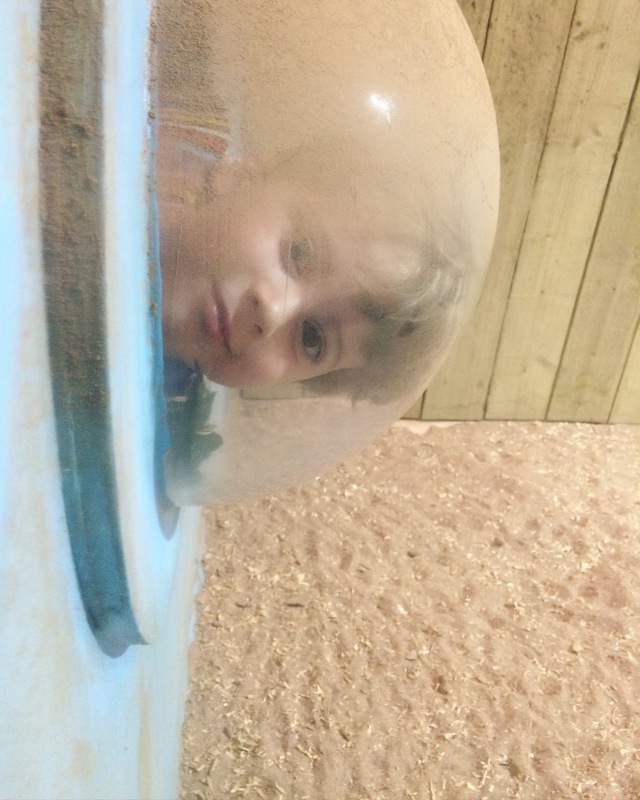 But they were definitely very entertaining to watch – especially since we love the book Meerkat Mail by Emily Gravett (affiliate link) – and the boys loved the ‘bubble’ viewing windows that let you stick your head right in to the Meerkat enclosure. 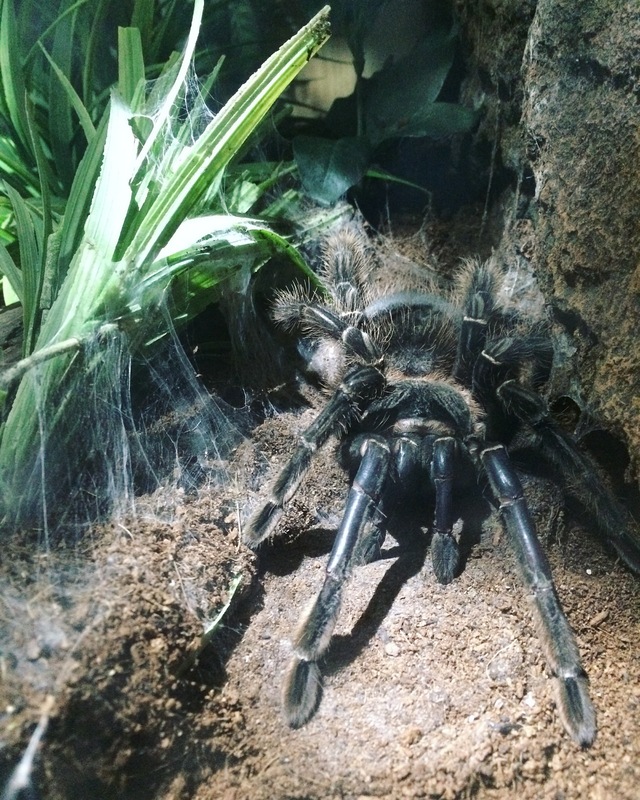 There were also some other non aquatic animals on display, such as the arachnids – the tarantula and the glow in the dark scorpions were a favourite – and some more reptiles of the kind that prefer dry land. 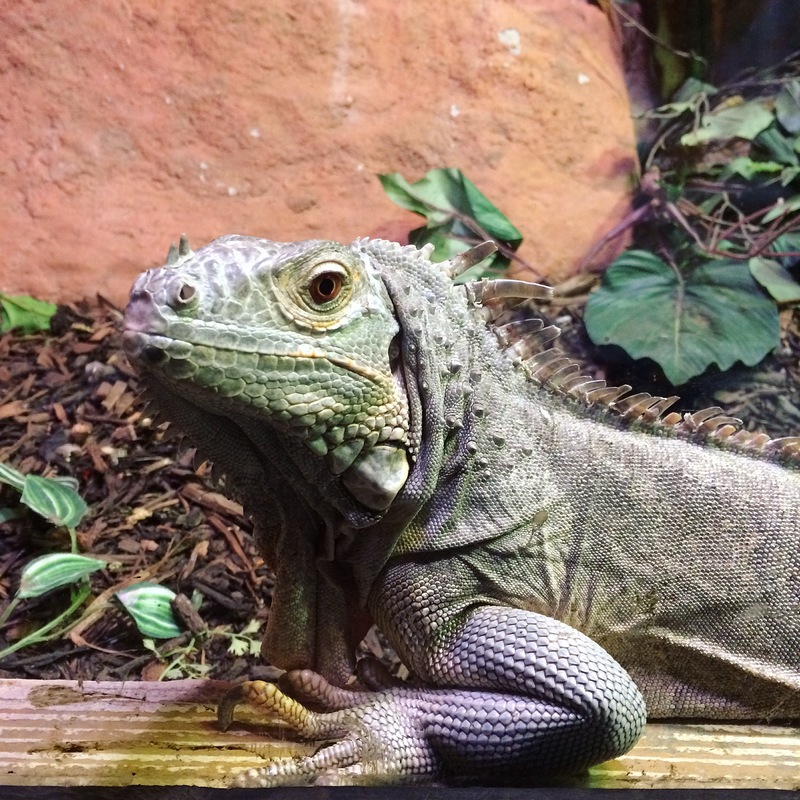 The highlight of our visit, was the reptile handling session. On this occasion, we got to stroke a bearded dragon and hold a snake (much to my shame, I have forgotten what kind it was). 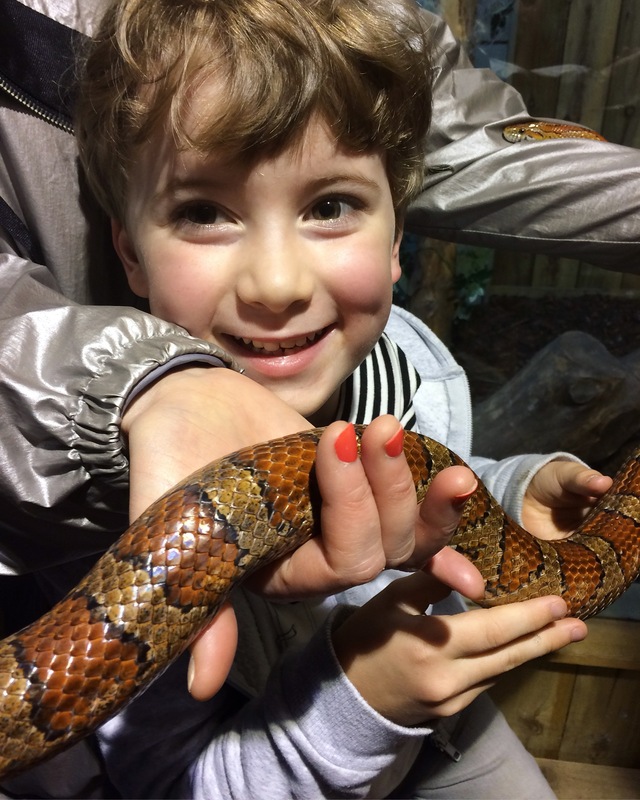 The boys were particularly delighted, when the cheeky snake decided to slither up inside mummy’s sleeve! 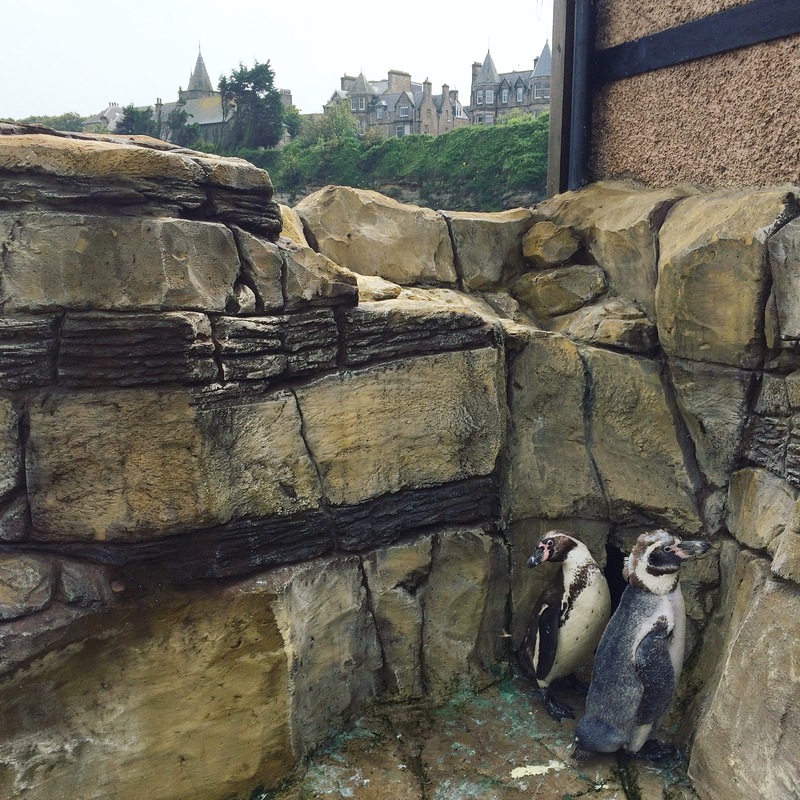 Last, but not least, there was another outdoor enclose with a bunch of Humboldt penguins. 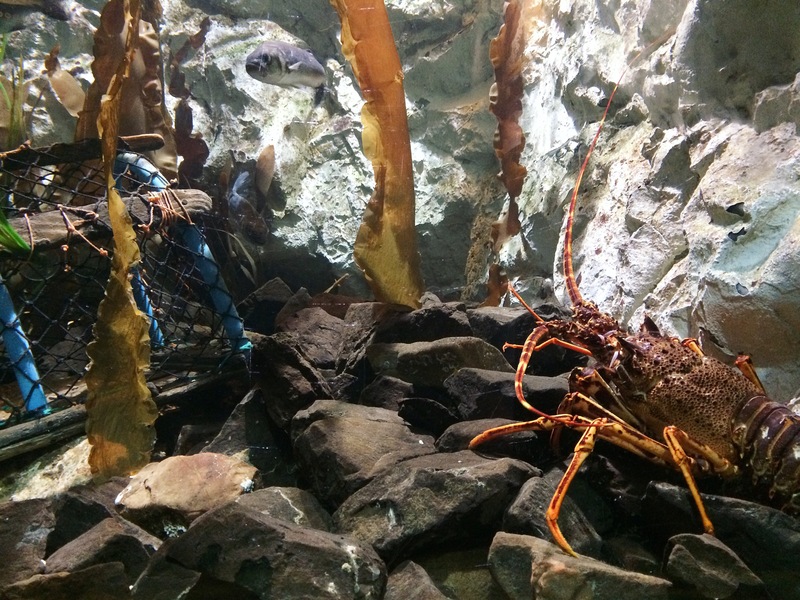 In total, we spent just over two hours at the Aquarium, including having lunch in the cafe there, which offers a simple menu with kid friendly choices, and baked potatoes for gluten free eaters like myself. 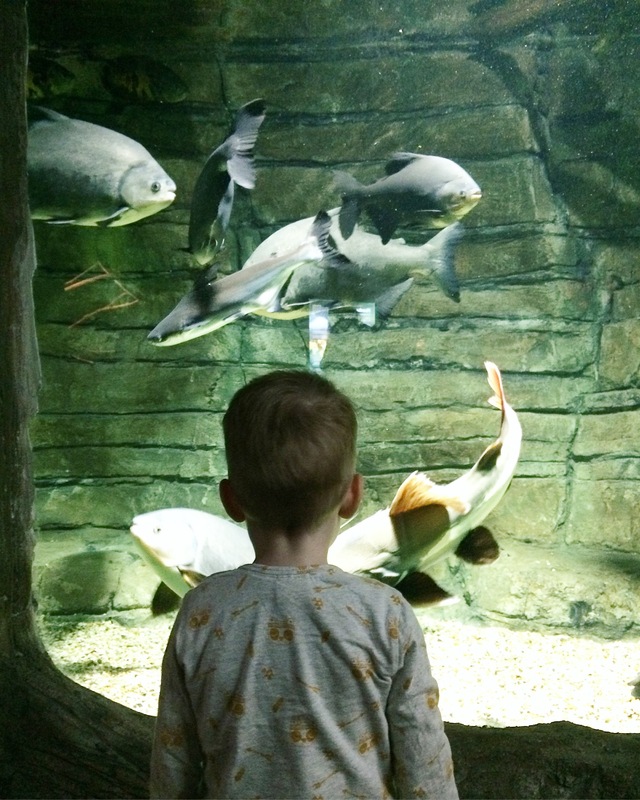 To be honest, for the price, I expected the Aquarium to be slightly bigger, but the boys enjoyed themselves and Mr Fox got in for free because kids under 3 years don’t have to pay. It’s also not particularly barrier free, with stairs leading to the toilets, shop and cafe, and to the main viewing areas, but you can park your stroller up in the entrance. It’s probably a better idea anyway, since many of the areas are not very spacious, especially when it’s busy. 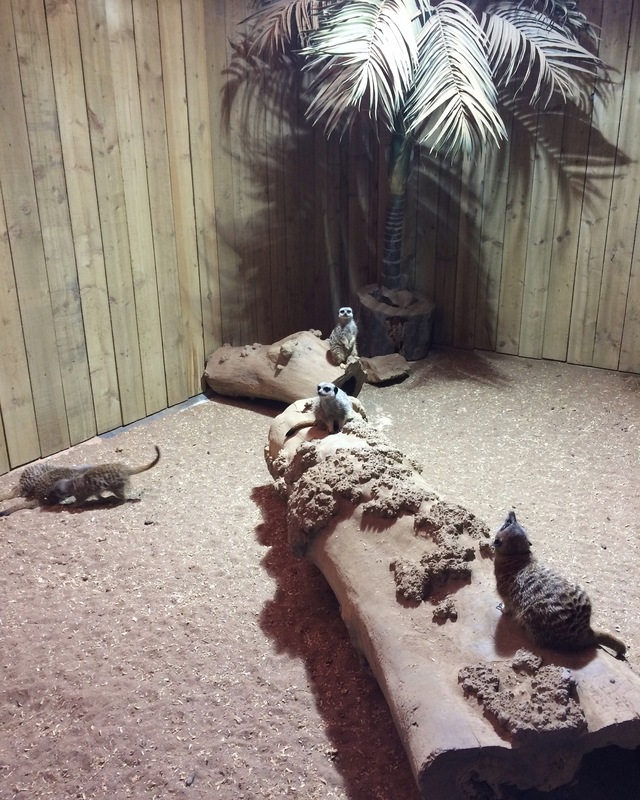 Your ticket gets you in and out all day, so you can go away for a wander around town or some lunch, then come back for any of the feeding times or handling sessions – there are several throughout the day, with Meerkat and Penguin feedings, as well as the Seals and the Reptile sessions already mentioned. All in all, we had a great time, and the boys were talking about it days later. 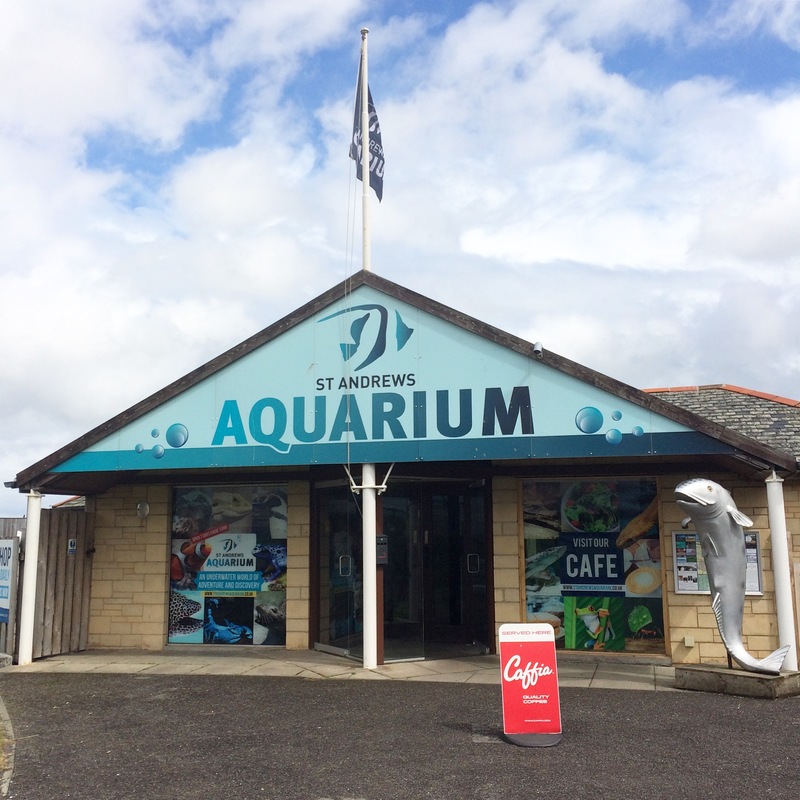 St Andrews Aquarium is open daily, except at Christmas and New Year. You can find all the details for opening times and prices on their website. 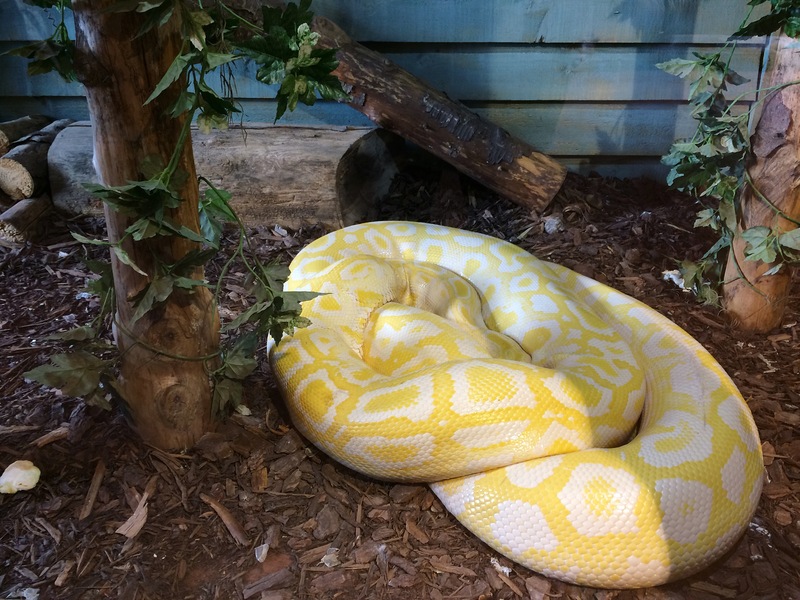 I do love an aquarium so wonderful to get up close to sea life but the showstopper really does have to be those snakes!!! 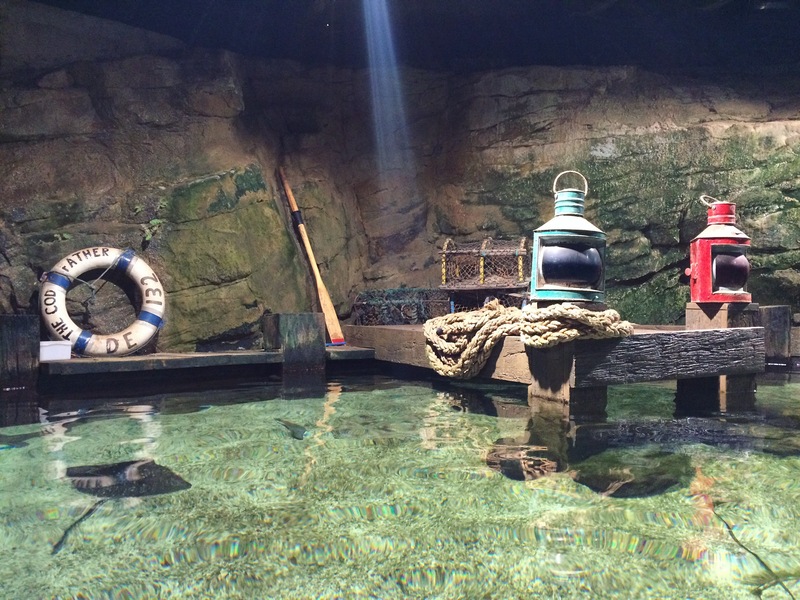 It looks a lot better than the aquarium nearest Edinburgh and worth the extra travel! Although I’m not sure about snake handling! This looks like a cool place to visit. We love visiting places like this. The snakes are just too close for comfort. What a lovely day out! 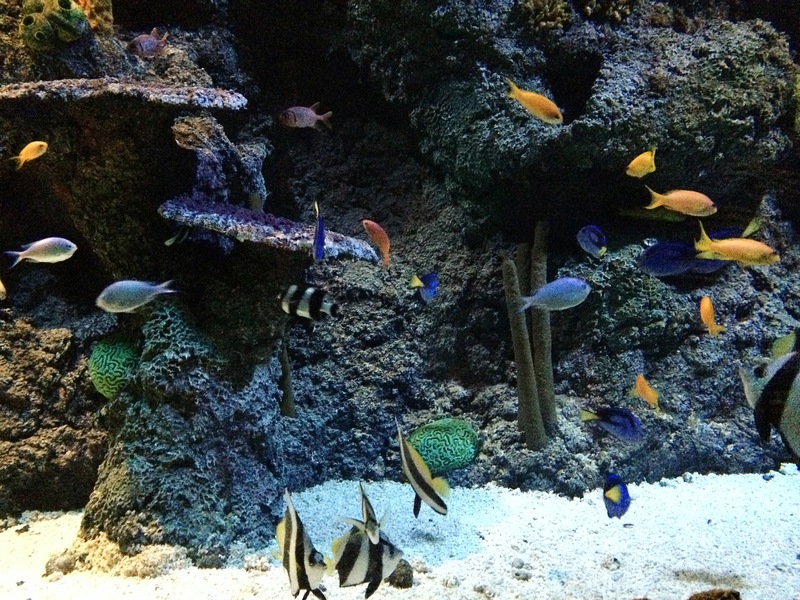 My two love an aquarium visit, but this one looks amazing! 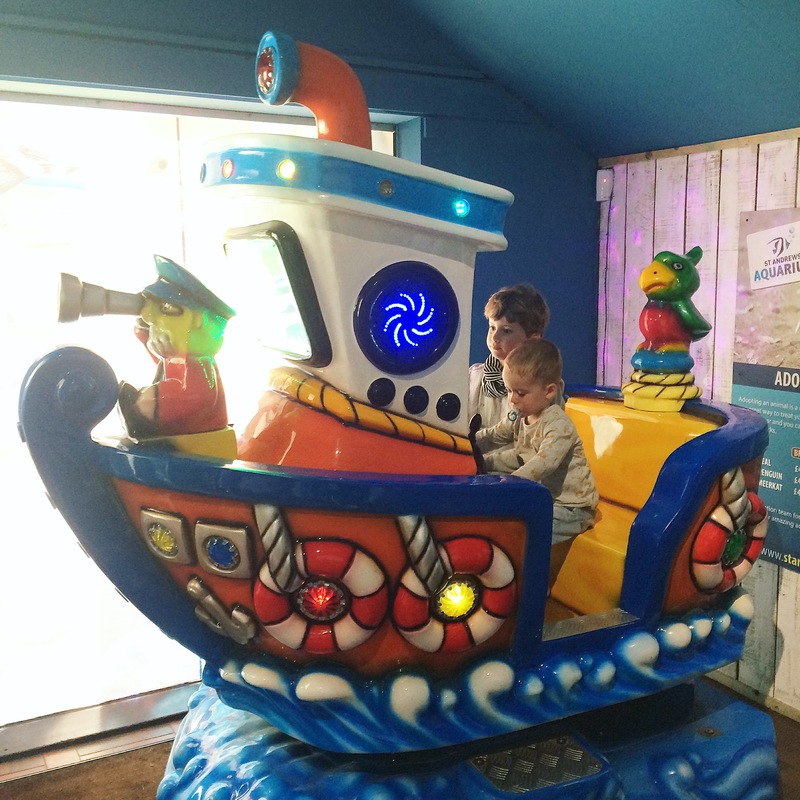 What a fab place to take the kids! I confess I’ve never spent any time in Dundee (my luggage has though when some guy took it off the train en route to Glasgow instead of his wife’s! ).